Order On-Line or Send Checks & Money Orders To: Creepy Classics, P.O. Box 23, Ligonier, PA 15658. 7,250 Classic Monster Products Available! Big Wolf Man issue with photoplay of rare and favorite photos from THE WOLF MAN (1941). Forry Ackerman, THE WITCH'S DUNGEON, SPACE MONSTER, 13 DEMON STREET, Lon Chaney Sr., Tor Johnson, George Zucco, Forrest J Ackerman, the Creepy Crossword, Terror Test and more. Writers in this issue include Tom Weaver, Rick Rogers, G.M. Goodwin, Dennis Vincent, Larry Fultz Jr., Scott Essman, Barb Heiss, Kevin Surnear, Ron Adams, Eyrdie Robinson, Professor Anton Griffin. Artists include Lorraine Bush, Kerry Gammill, Jary Lesser. "Monster Bash Convention Dealer Tables"
phone: (724) 238-4317 Call anytime! Leave a message if we don't pick-up and we'll call you back. 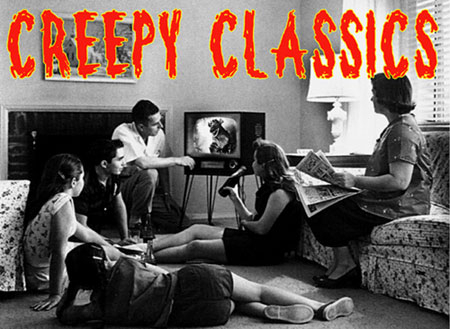 With any purchase, you will receive a free e-mail newsletter subscription to the Creepy Classics News. If you do not wish the newsletter, please e-mail: creepyclassics@creepyclassics.com.